“The international community should band together to keep the spotlight on the unjust imprisonment of Sotoudeh and other political prisoners in Iran including women’s rights activist Farhad Meysami as well as Sotoudeh’s husband, Reza Khandan,” said Hadi Ghaemi, Executive Director of the Center for Human Rights in Iran (CHRI). “Failing to do so will give Iran’s judiciary and security establishment, including the Revolutionary Guards, a green light to continue imprisoning citizens for their peaceful actions while trampling on the rights to counsel and a fair trial,” he added. The resolution was adopted on December 13, 2018, by 552 votes in favor, 6 against with 38 abstentions. 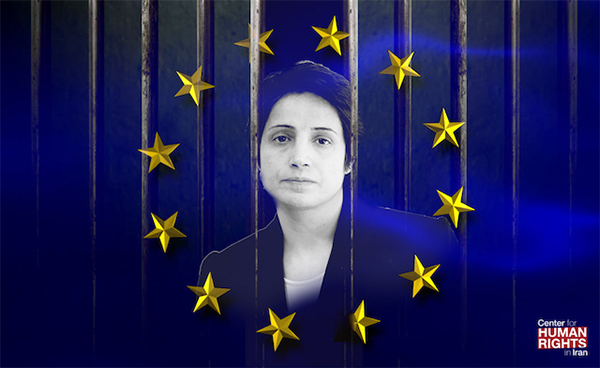 “[The European Parliament] calls on the Government of Iran to immediately and unconditionally release Nasrin Sotoudeh; commends Nasrin Sotoudeh for her courage and commitment; urges the judiciary system of Iran to respect due process and fair trial and disclose information on the charges against Nasrin Sotoudeh,” said the resolution. The resolution was passed less than two weeks after Sotoudeh, detained in Iran since June 2018, was told she would be facing an additional charge for allegedly receiving a cash prize from the European Parliament six years ago—a human rights award she never physically received. Sotoudeh is currently jailed in Evin Prison in Tehran and facing a five-year prison sentence as well as four other charges. The charges, all national security-related, were issued following her outspoken advocacy of human and women’s rights as well as her willingness to take on politically sensitive cases as a defense attorney. Several other human rights lawyers have also been arrested and imprisoned in Iran this year in a widespread crackdown initiated by the judiciary aimed at further limiting defendants’ due process rights as well as wiping out peaceful activism throughout the country. To protest the unlawful judicial process and denial of the right to choose her own lawyer in her own case, Sotoudeh has refused to appear in court to hear any of the recent charges against her, a source told CHRI on November 30. Sotoudeh went on a second hunger strike on November 26 to protest the Iranian authorities’ refusal to allow Meysami to receive hospital treatment. Sotoudeh has previously served prison time for peacefully working as a defense lawyer. From 2010-13, she spent three years in Evin Prison. Several rights organizations including CHRI as well as international actors have called on Iran to free Sotoudeh following her most recent arrest. In July 2018, the International Bar Association’s Human Rights Institute sent a letter to Iran’s Supreme Leader Ali Khamenei calling for Sotoudeh’s immediate release. In August 2018, 60 members of the European Parliament called on Iranian President Hassan Rouhani to “do all within your power to ensure” the “unconditional release” of Sotoudeh. One month later, Sotoudeh was awarded the prestigious Ludovic Trarieux Human Rights Prize for her commitment to human rights and the independence of the legal profession. “The preventable death of Vahid Sayyadi-Nasiri in state custody after his two-month hunger strike is a reminder of the extreme lengths political prisoners in Iran are going to obtain basic rights, as well as the unjust costs they are forced to pay,” said Ghaemi. “Countries around the world, particularly those that maintain relations with Iran, can help end this disturbing trend by sending a clear message to Iranian officials that they will not turn a blind eye while these rights abuses continue,” he added.